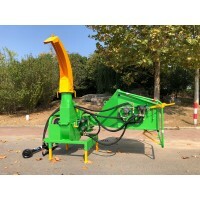 BX52 wood chipper is available now. Nova Tractor BX52 wood chipper is ideal for small compact tractors with 18hp to 50hp with CAT I. 3-point hitch. Visit our Youtube channel to see BX52 working in action. 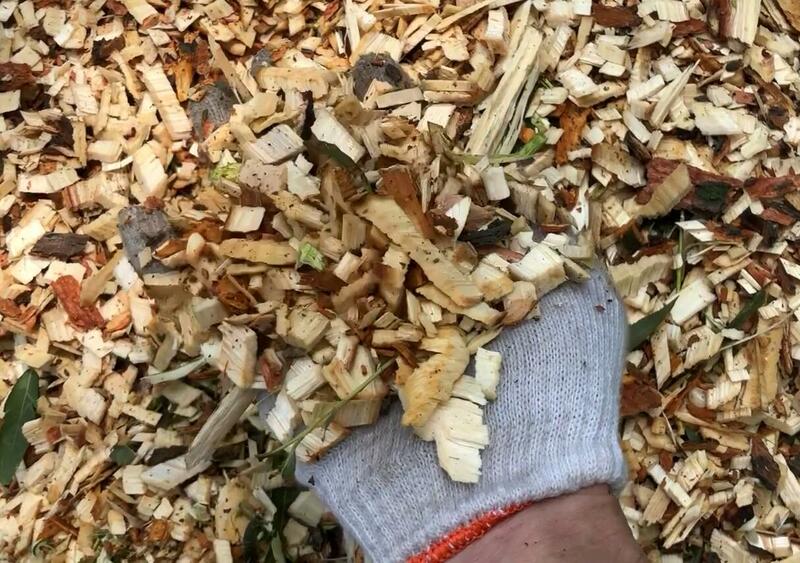 The NOVA TRACTOR BX wood shredders are available in three categories with and without hydraulic feeding system. The NOVA TRACTOR BX52 is a powerful and robust but easy to handle wood chipper for wood diameter of up to 5inch. The BX52 wood shredder comes with a free PTO shaft.To get maximum performance your wood shredder, your tractor should have at least 30HP and a PTO shaft speed of 540 RPM. 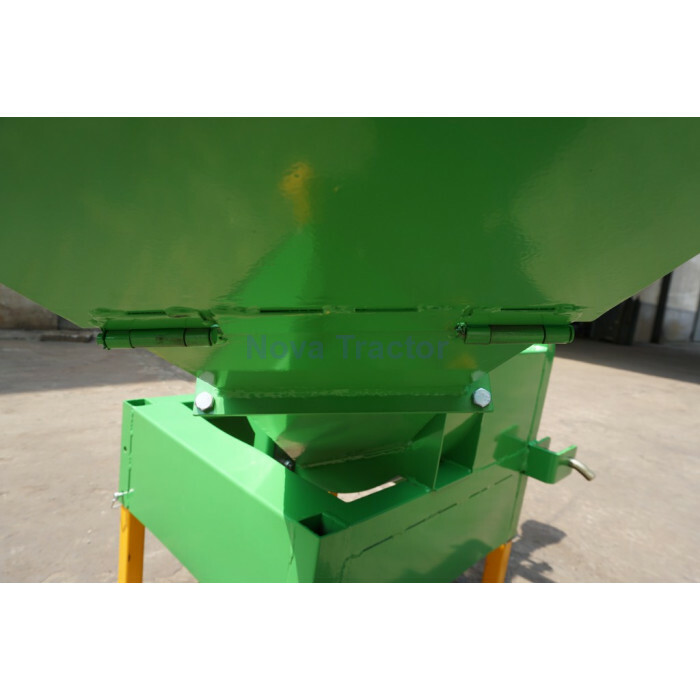 We from NOVA TRACTOR Tractor firmly believe that you will not find a better value for money heavy duty tractor wood shredder in the market. Feel free to compare our product to others in the market and we are sure you will agree. Heavy duty rotor and replaceable rotor shaft: The durable rotor is 143 lbs and 2/3 inch thickness. All of our chipper rotor are precisely electrically balanced. The direct PTO drive system turns the well balanced 143 lbs rotor inside the wood chipper. The rotor shaft is separately replaceable.The rotor is directly driven by the PTO shaft which is included in the shipment. 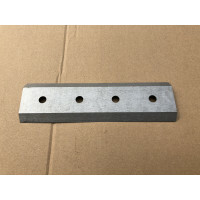 A8-tooling-steel knife: It's with four 8.2 inch length knives from hardened A8-tooling-steel. The rotor knife is reversible. Perfect chipping performance: The fast turning knife rotor is cutting the wood about 35 times per second which pulls in the material. 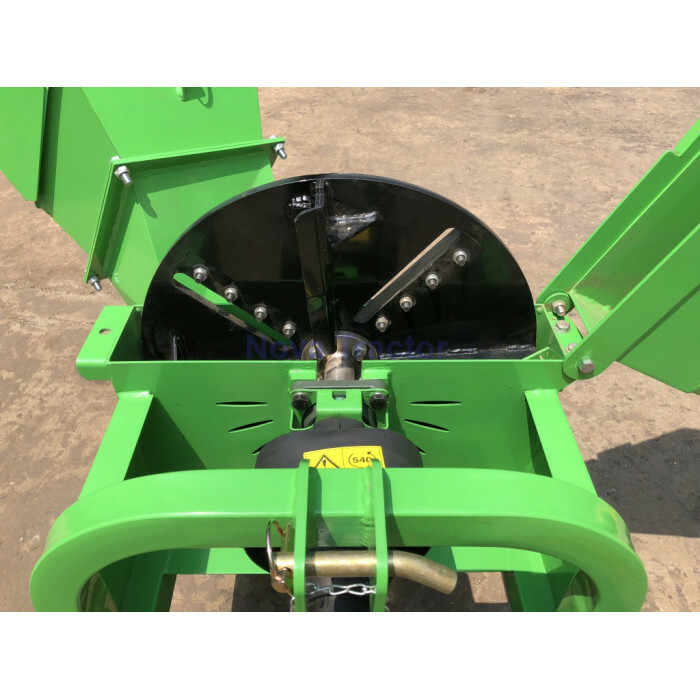 The newly designed counter knife setting of the wood shredder allows a precise 0 - 0.2 inch distance setting to the rotor knives and creates shredded material from 0.7 to 1.5 inch in size. Good design on aerodynamic: The high rotor speed and the specially designed rotor winglets create an air suction inside the wood shredder, which throws out the shredded material and makes wood jams virtually impossible. Branch beaker: The rotor housing is equipped with replaceable branch breakers that will reliably reduce the size of very thin branches with less than 5mm diameter. 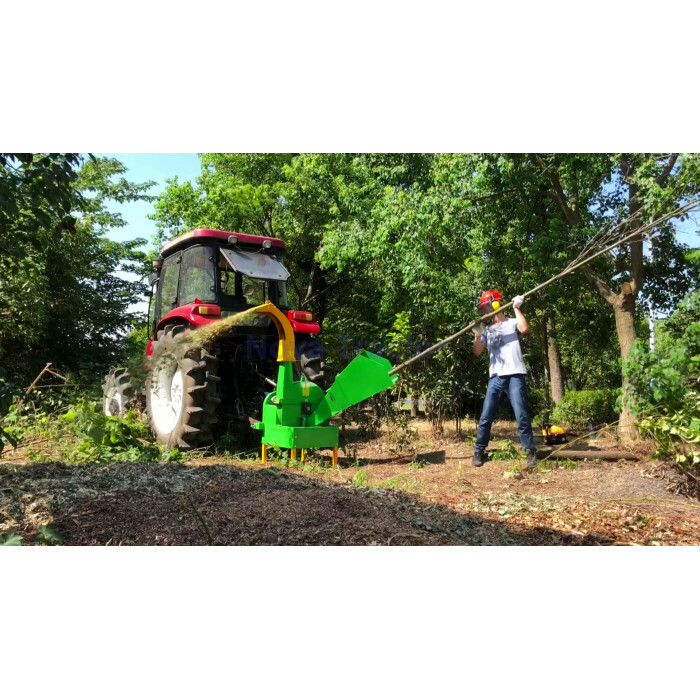 Compatible for 1000RPM PTO: For difficult material like bamboo, willow or pine tree branches your can even use 1000 rpm PTO speed for a limited time as all of our machines use well balanced rotors in the wood chipper that can be run at this speed. 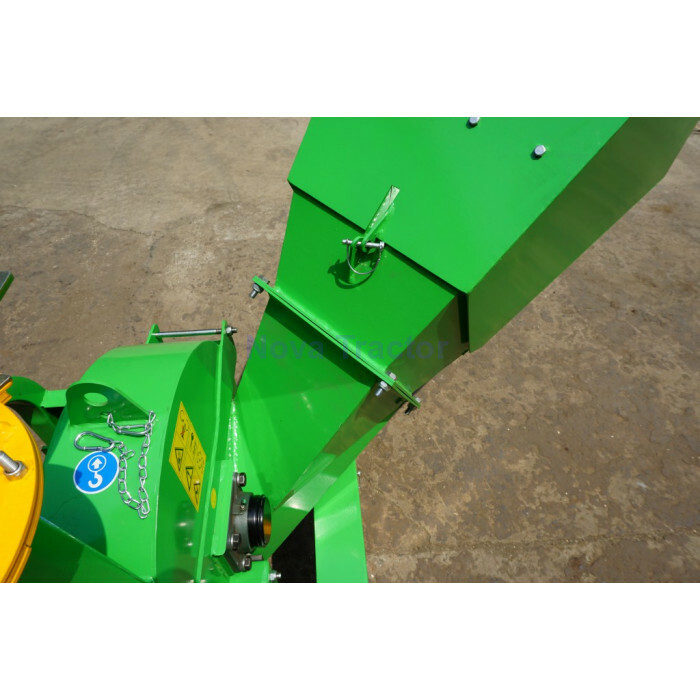 Efficient shredding capacity: The wood chipper discharge funnel is located in 72 inch height and can be turned by 230° with an adjustable throwing angle. 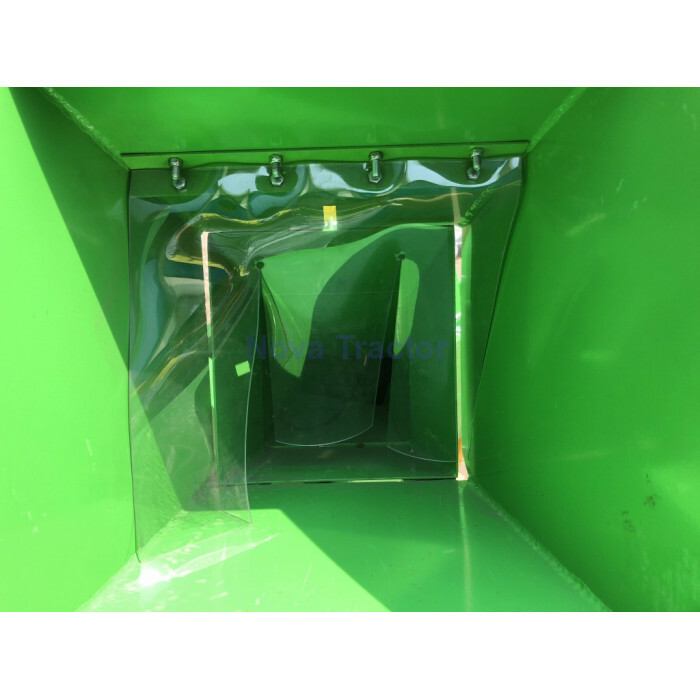 The shredded material can be thrown up to 6 meter in distance making it easy to fill trailers or containers. The shredding capacity is 6 - 7 m³/h depending on the type of wood. Easy maintenance: The BX-52 is designed for easy maintenance. The rotor cover can be opened by removing only one screw to get access to the knives. Folding feeding chute: For easy transportation and convenient storage, the input chute can be lifted up and secured by a pin. 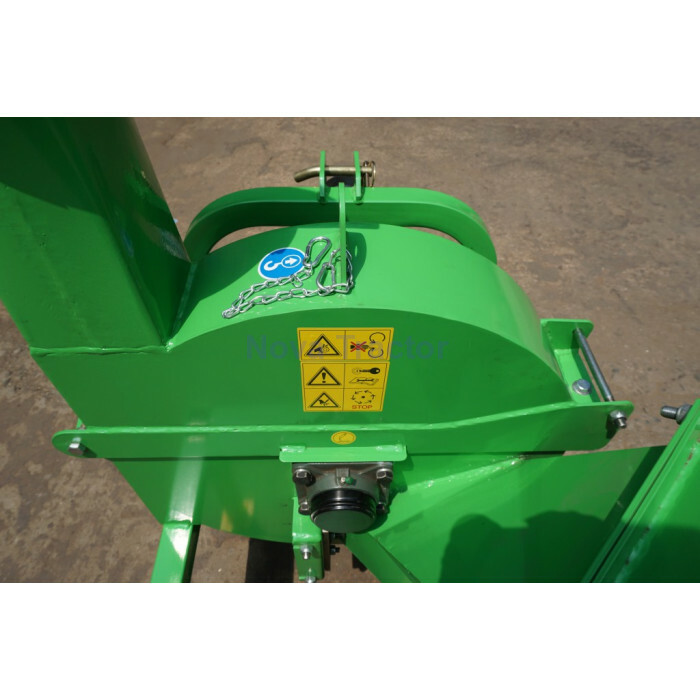 The NOVA TRACTOR BX-52 wood shredder wood chipper comply with all safety regulations and is CE tested following the 2006/42/EC machine directive.